Evergreen is now moving forward with the migration from Banner 8 to Banner 9. This project has been in the works for many months now but it officially kicked off January 2018 in preparation for Oracle dropping support for the form technology that supports Internet Native Banner (INB), the forms interface for Banner 8. The deadline for this change is December 2018, a date not to far into the future. What does this mean to Banner users on campus? Those who regularly use INB forms will find their work in an updated java-based interface now called Banner Admin Pages. The underlying infrastructure will still be for all practical purposes the same Oracle database. The way people interact with Banner though will shift considerably. Over the next 4-8 months Banner users will be asked to engage in various levels of testing once Computing and Communication staff move the two platforms into a single/parallel infrastructure, so both Banner 8 and Banner 9 can be used at the same time. We will be asking our Banner users to test Banner 8 work processes using the updated infrastructure during the month of March. April will then see a shift towards dedicated testing of college workflows in the Banner 9 Admin Pages. Onces these workflows satisfactorily meet the business needs of the different administrative offices, then they can completely migrate their workflows to the new Admin Pages in preparation of the December 31 cutoff of the INB technology. 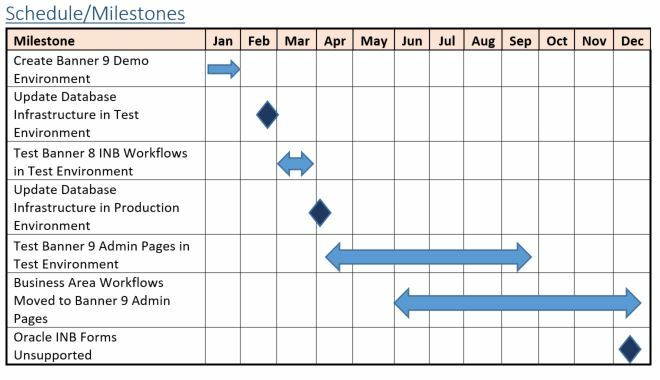 Below is the basic timeline for the project. Business areas of the college are represented by an area lead. This team member will be responsible for attending implementation team meetings, helping coordinate testing as well as building training strategies for the workflows for their and associated areas who leverage similar forms. Rip Heminway is the Banner 9 Project Manager and will be organizing and facilitating meetings for both the implementation and technical teams. Tony Alfonso is the chair of the Steering Committee who will be making decisions as necessary to ensure that an institutional perspective is maintained throughout the implementation process. The steering committee is tasked with defining/untangling policy related issues, securing critical resources and defining broad project outcomes. The management of the project and all documentation will be built in and shared via the Redmine Project Management platform that is maintained by Computing and Communications. If you would like to get access to this more detailed resource, please contact Rip Heminway at X6904. If you have questions or comments about this plan, please leave them and they will be answered as quickly as possible. This entry was posted in IT Projects, System Updates on February 13, 2018 by Rip. Parking Services: Susie is meeting with Aaron soon to discuss technology issues in Parking Services. James & Jamie believe that this is related to a reporting tool she would like to implement called Flywriter. Background information was given on the scenario. Retreat Planning: Aaron will look at last week’s notes and will create an initial agenda for us to review and give feedback. Two-factor/IDM: Aaron will contact UW to find out what they are using to see if it’s worthwhile to go visit with them to get more information on their products/systems. Management team still needs to discuss what method we want to go with as far as 2-factor authentication (token, mobile, etc). Security Plan: The security plan is about 90% done. James is working on it. Accreditation: The accreditation work Rip facilitated has been finished and passed on to Collin. We will need to probably revisit this in a few months. Media Services Server/Storage Request: This is potentially a very large system with considerable implications for impact/security on college IT infrastructure. Important to get a clear plan from Media Services with cost, outcome, objectives, impact and risks. This should be discussed with Amy Betz and/or Michael Zimmerman. Aaron will get with Amy to add to competing Academic Project list. ORS Phase 1 and Phase 2: Legislative request going forward and need an investment plan. Risk assessment on each individual project separately. Tony will put together the initial project plans for the OCIO and send out so the other managers can contribute. Goal is to have this complete by end of July. OCIO IT Spend Tracking: There may be an update to the online portfolio process that will be a hosted service called Apptio. Stay tuned. Web Designer Position: Job to be posted this week. Network Engineer: There are some applicants and the committee is moving forward. Client Services ITS2: Lots of applicants. Evaluations: Get them done and update job descriptions when needed. Space: Lots of moving around, dominoes and displacement. More people than space… We need to develop a comprehensive plan and something longer-term and maybe an open seating/cubical plan. Plan for a break room that is available and inclusive for all of C&C. Agenda item for our retreat? Consider other solution for the Training Room? Mobile cart with secure wireless available? This entry was posted in IT Management on June 25, 2012 by Rip. This entry was posted in Featured, New and Cool on May 17, 2012 by Rip. Those who’s mailboxes have been migrated to Exchange 2010, your mailbox will be getting updated with the newest virus protection toolset; Sophos. 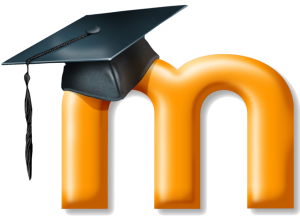 The college has recently moved to Sophos for all desktops, servers and applications and we are now beginning the transition to a more flexible and hopefully full featured product. Contact Barbara C. if you have any questions. This entry was posted in IT Projects on March 1, 2012 by Rip.